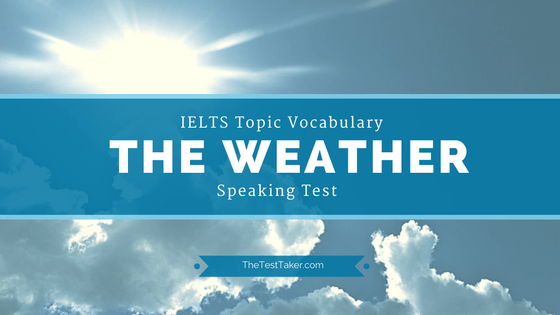 In this article you will find lots of great vocabulary related to Weather. I tried to research on the Internet and find not only vocabulary-rich but also interesting sources to help IELTS test takers master this topic: Articles, Podcasts and Videos. In the end of the article I will leave a link to downloadable PDF so you can save it to your computer and read later. Be sure to use it every time you practice speaking and need useful phrases or words. What’s the weather like in your country? How do rainy days make you feel? What do you like to do when it’s hot? What do you usually do in the winter? How many seasons does your country have? What is it and when does it come? Changes happen in this season. Things you like to do in this season. Describe a kind of extreme weather. What should you do in a bad weather? Will bad weather mould or change people’s personality? What is the relationship between weather and culture? The climate has changed these 50 years. Have you noticed the changes? What are some other examples of bad weather in the world? How do people deal with bad weather? Do you think there is anything that we can do to prevent bad weather? Do you think there are any problems with the world’s climate now? How do you think these problems were caused? Why did people ever decide to live in places with bad weather? What is TheWeather Like In Your Country Now? What is the weather in your this month? I can’t stress it enough how valuable this source for those who need to learn Weather vocabulary. Luke from teacherluke.co.uk provides a ton of free audio materials for English learners. He’s professional and experienced teacher with a very popular podcast. What’s great about this resource is that you can find transcript for each episode including one devoted to Weather. This is second podcast episode about weather I found on Luke’s blog. Enjoy it! when it’s sunny we tend to be…. I just wanted to share this article called IELTS Speaking Test Part 2 sample answer: Talking about the weather I found onDailyStep.com. I believe it can be very helpful for your preparations. Full answer with transcription, downloadable audio, useful vocabulary and synonyms can be found there. Be sure to check it out.